If you’ve read The Flavours of Love you’ll know that the main character, Saffron, is holding a bowl of blackberries when she receives some devastating news. While she eventually decides to use blackberries in a recipe that also has some significance to her, I’ve come up with this one that I hope you’ll enjoy. It’s really easy to make, really tasty and perfect for the hot weather. 2. Wash the blackberries (or whatever fruit you’re using) and roughly chop them up. Place in a covered bowl in the freezer for up to 1 hour. If the blackberries are particularly tart, I add half a teaspoon of agave syrup before freezing. 3. The excess liquid from the yoghurt will collect at the bottom of the bowl after the 2 hours (or however long you leave it) so tip the strained yoghurt into the mixing bowl of a stand mixer, or into another mixing bowl if you have a hand mixer. Add the vanilla paste and 2 tablespoons of the agave syrup. Mix until well blended then check for taste. If you’d like it a bit sweeter, add more agave syrup. (You can add more than the 4 tablespoons, but that’s enough for me.) Mix again until light and fluffy. 5. Remove the blackberries from the freezer and gently break them up. 5. Spoon the yoghurt mixture into a freezer-safe container with a lid. Slowly stir in the blackberries. Cover the container and place in the freezer. 7. After 45 minutes, remove from the freezer and stir the yoghurt mixture well, making sure to incorporate any frozen yoghurt or ice crystals that have formed along the sides or bottom of the container. Return to the freezer for another 45 minutes, then repeat the stirring procedure. Return to the freezer for a final 45 minutes. 8. To serve, remove from the freezer about 10 minutes before you want to eat it, then spoon into bowls or individual ramekins like the ones in the picture. You can also serve with cakes or pies – anything you’d usually serve with ice cream. 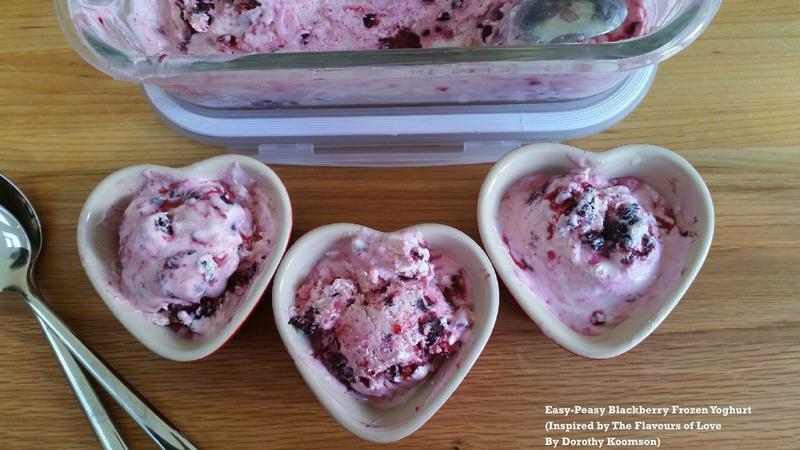 * I’ve also made frozen yoghurt using blueberries and raspberries and all three berries together. You can experiment with other fruit, obviously. If you fancy just a vanilla flavour, increase the amount of vanilla paste you use by half-teaspoons, checking until you have the right flavour. * Since Greek-style yoghurt has already been strained before it is packaged, you don’t strictly need to strain it, but I do because it makes the frozen yoghurt taste much creamier. * The same goes with whipping/whisking the yoghurt: it’s not necessary – as long as you make sure the vanilla paste and agave syrup are properly mixed in – but I find it makes the final texture much more like ice-cream. *You also don’t need to partially freeze the fruit but doing so will stop it making the frozen yoghurt too watery and therefore icy and difficult to serve once set. *Generally the frozen yoghurt gets eaten quite quickly in our house but you can keep it for a couple of weeks. * You can use Golden Syrup or honey if you prefer in place of Agave Syrup. * I use Yeo Valley Organic Greek-Style Yoghurt, Neilsen-Massey Vanilla Paste and The Groovy Food Company Agave Syrup.